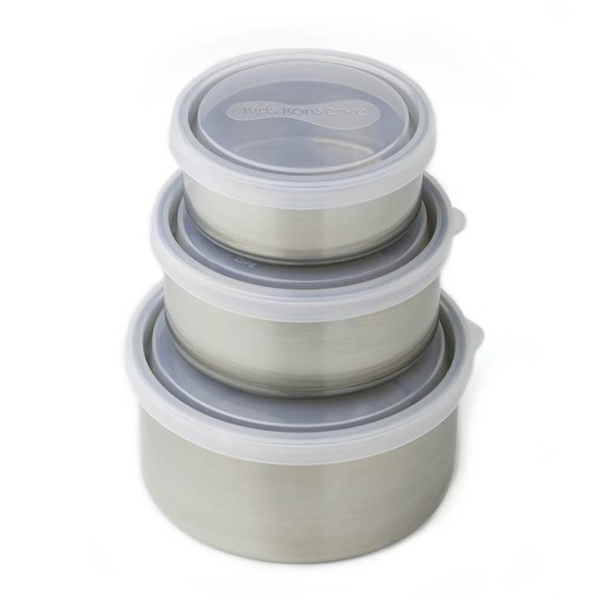 Kids Konserve Nesting Trio is a super versatile set of 3 high quality stainless steel containers with leak-proof lids. These smart, re-useable stainless steel containers are perfect for packing yogurt, fruit salad, pasta salad, pretzels, hummus, nuts, fruit and lots more! Popular for school lunchboxes and snacks in the car, they are also useful for work lunches and storing leftovers in the fridge. Once you are finished using them, they stack away neatly inside each other for compact storage. 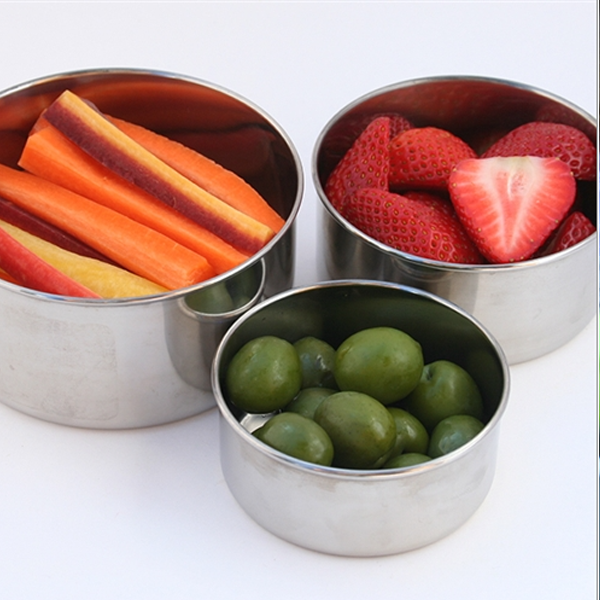 All Kids Konserve Stainless Steel Containers are all free of BPA, phthalates, PVC and lead. They also co-ordinate with our insulated lunch bags and drinking bottles for putting together healthy packed lunches. All containers have a clear lid. Dishwasher safe, top rack recommended. Although the lid is dishwasher safe, research has shown that for long term durability it is best to keep plastics out of high temperature environments like microwaves and dishwashers - extreme temperature changes might cause lids to crack. Please remove stickers before getting container wet to prevent sticker residue. The containers are made from #304 (18/8) food-grade stainless steel. They come with #4 LDPE lids which are leak proof (as long as the kids put them back on properly of course!). LDPE is low density polyethylene which is widely recyclable.